For owners of self-storage facilities, it’s coming to that time of the year when maintenance is critical to keep the area looking its peak best. Spring maintenance is a process all facility owners must undertake to help keep their organization running smoothly and to protect their clients’ belongings against damage from the elements. 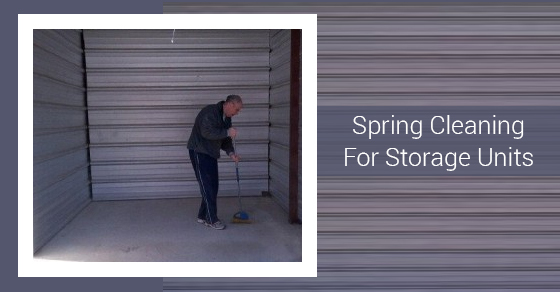 In this article, we’ll present a quick guide to spring cleaning for self-storage units. The first step in any business maintenance process is to conduct a complete walk-through of the facility and determine the areas that require additional maintenance work. Look for the signs of potential safety and structural issues. You might find water damage within property areas, which may indicate a leak. You might also notice cracks appearing in doorways and around entranceways. Make sure these issues are fixed within a quick timeframe to preserve the safety of the facility and protect the area against water and animal intrusion. Many of your clients will be moving belongings in and out of the facility outside their own work hours. This may mean they’re using the facility well into the evening time. To do so safely they need optimal lighting within the storage space. Conduct a complete analysis of the lighting within storage units and loading areas and replace any burnt-out bulbs you discover. This might also be the time to consider installing high-efficiency lighting options, to reducing your long-term energy costs. The locking mechanism in each door within the facility should be checked for optimal performance on a regular basis. This is an important element to add to the spring cleaning process, because it will ensure a lock issue is identified at the earliest available opportunity. Any locks found to be ineffective or otherwise broken should be replaced immediately by your maintenance team. The restrooms provide your clients a much-needed convenience as they store their items within your facility, and so it’s important this area is cleaned as part of the spring cleaning process. Review the area completely to ensure all elements are working as required and restock the space so it’s ready for use throughout the day and night. By completing a thorough spring maintenance process within their facilities, storage facility owners can ensure their business is ready for success over the spring and summer months, and beyond. To discover more on spring maintenance for your business, speak with our trusted team today.